With the closing out of 2017 beginning, the klaxon of final festival was sung this weekend with Damnation Festival in Leeds. A veritable smorgasbord of bands to suit the palette of any extreme metaller, its one of the years most anticipated festivals. Fitting then that the dynamic dismal duo of Pallbearer and Paradise Lost would be performing their first show at London’s Electric Ballroom. Bring out the misery in their droves there’s nothing quite like it on a Friday night. Releasing one of the most intriguing records of the year, what more of a fitting way to see the year begin to draw to a close than with Pallbearer absolutely ripping up the stage here at London’s Electric Ballroom. Proving that they are more than worth their mettle the band aren’t phased by technical difficulties during opener “World’s Apart” which plagued guitarist Devin Holt during the opening track. Nevertheless the band aren’t phased and heroically pull off this glitch with frontman Brett Campbell taking the pressure of along with Joe Roland stomping all over the stage, with a weight that matches the iron clad riffs. “Fear and Fury” however sees the band bring their now signature iron clad riffs, accompanied by what is sure to be soon a melancholic patent. Despite only playing four tracks, the band cross a smorgasbord of soundscapes particularly in “Dancing In Madness” taking the audience of Camden’s Ballroom with them. Recreating the same sense of escapism that personally beguiled me upon hearing Heartless. As Joe Roland, the bands anchor and bass player shouts out “We’re a bunch of nobodies from nowhere in the US but every time we play here it makes us feel incredible” the latter half of the sentiment couldn’t be more true. However after the whirlwind of a year, it would be hard pressed to believe that the band were “nobody’s”. Serving up not only a note perfect performance but one that was packed full of aural audacity and heartfelt emotion, seeing Pallbearer live merely enhances their already luminary studio recordings. Following a speedy changeover, the dramatic introduction that creates the soundtrack to Paradise Lost’s entrance is a cinematic coup. Launching, at a snails pace, into “From The Gallows” the maudlin bunch cast their iron riffs into the crowd. Led by riff blacksmiths extraordinaire Greg Mackintosh and Aaron Aedy melodies are expertly delivered. Despite the more ferocious sounds the band purveyed on their last record, the likes of the downtrodden “Beneath Broken Earth” work well in the setting of the band tonight. Birthing their agression via their two other side projects, the byproduct of which has fanned a raw, creative fire. Its interesting to hear newer cuts from the raucous Medusa unleashed tonight. 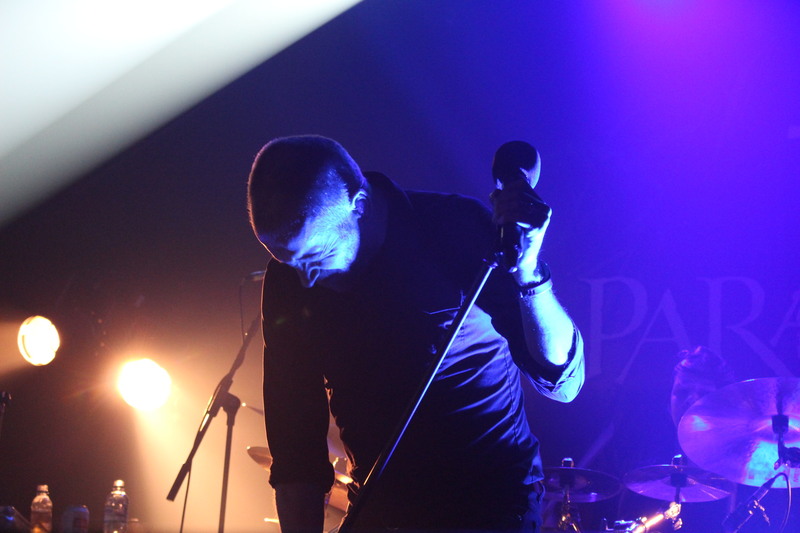 Nestled in where perhaps between their more Gothic era of material the likes of “Erased” work perfectly, against the more aggression oriented drive of The Plague Within’s “An Eternity of Lies” and even album title track “Medusa”, the common ground of piano seems to be engrained into Paradise Lost‘s sound. With frontman Nick Holmes air chipper tonight, despite nursing a sore throat, he delivers the goods particularly in “One Second”. Peppered in with the distinctly northern demeanour, despite their sorrowful tones, you can tell that Paradise Lost are having a great time. Enlisting drummer and Vallenfyre cohort, Waltteri Väyrynen the man has both dexterity behind the kit as well as power. Returning after their encore for the distortion oriented smack down that is “No Hope In Sight” Mackintosh’s signature leads linger throughout the Ballroom tonight. However its the final stroke of “Say Just Words” that always leave their lasting effect. As the wind begins to bite, its clear that we’re heading into the worlds of winter and what better soundtrack for it than the gloriously morose, quintessentially Northern sound of Paradise Lost.